MOSCOW: Mario Mandzukic scored the winning goal deep in extra time as Croatia beat England 2-1 in an utterly gripping World Cup semi-final in Moscow on Wednesday to set up a final date with France. The Juventus forward netted in the 109th minute to complete a remarkable comeback from a shattered Croatian team and take the small nation of little more than four million people into the World Cup final for the first time in their short history. Kieran Trippier’s magnificent early free-kick had seemingly set England on course to reach their first final since they lifted the trophy on home soil back in 1966. 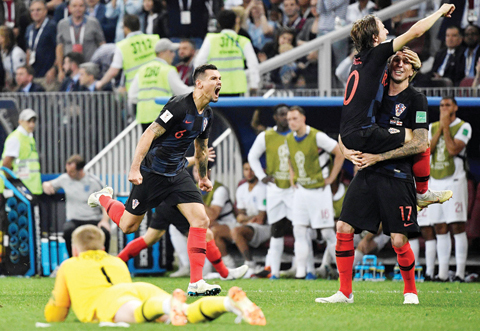 But it wasn’t to be, as Croatia came roaring back in the second half and equalised through Ivan Perisic before somehow finding the energy to win despite being taken to extra time for the third time in 10 days. The biggest winners of the night could well be France, who have had an extra day’s rest for Sunday’s final after edging out Belgium 1-0 on Tuesday. That will not matter too much right now for Croatia, who are the smallest nation to make it to the final since Uruguay back in 1950. England had been the ones hoping to make history, in what was their first appearance in the semi-finals in 28 years. Then they were beaten on penalties by West Germany. Having ended their famous penalty curse by beating Colombia in a shootout in the last 16, they might have fancied repeating here. They were looking to the inspirational Luke Modric to control the game, but instead it was he who gave away the early free-kick from which Trippier put England ahead. It was a fantastic curling effort from 25 yards from the Tottenham Hotspur full-back, and England’s first goal direct from a free-kick at the World Cup since David Beckham against Ecuador in 2006. England could not have imagined a better start. Croatia were stunned, and Ivan Rakitic, usually so accomplished, was especially off his game. Croatia hung on and it was to their immense credit that they turned the tide after the break in what developed into an epic encounter. Shooting towards the end of the Luzhniki Stadium where most of their fans were gathered, they equalised in the 68th minute, as Sime Vrsaljko crossed from the right and Perisic stole in front of the stooping Kyle Walker to score with his left foot. Having looked so comfortable earlier, England’s young side were rattled, and they were lucky not to go behind soon after as Perisic sent a low shot across Jordan Pickford and off the far post. Unable to get the second goal while they were on top, Croatia were forced into extra time again. Vrsaljko cleared a John Stones header away from in front of the line, but England had Pickford to thank for a brilliant save as Mandzukic connected with a devilish Perisic cross.